"When most people learn to play chess, they usually memorise the movements of the pieces and then spend years pummelling away at each other with little rhyme and even less reason. Though I will show you how each piece leaps around, what it likes to do on holidays, the real purpose of this book is to teach you to understand the four major principles of my Seirawan method: force, time, space and pawn structure. Each is easy to understand and each is a weapon that will enable you to defeat most anyone you challenge to a game", Yasser Seirawan. 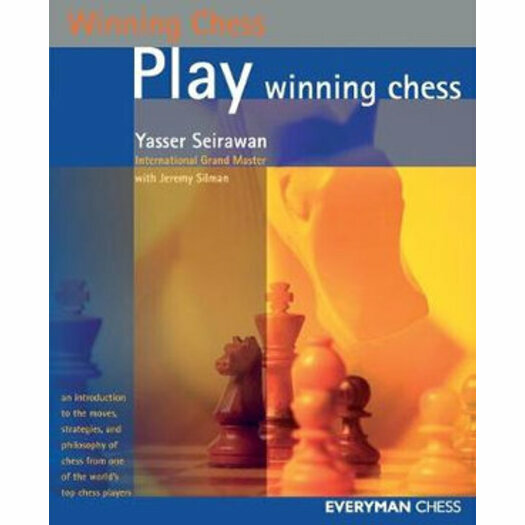 Play Winning Chess is an enthusiastic introduction to chess that will transform you into a veritable gladiator of the chessboard. Seirawan begins by explaining piece movement, chess notation, the rules of play and basic tactics. His examples, question-and-answer sections, psychological hints, and lively sample games help you learn strategies and play aggressively while having fun. Discovering how to engage in clever attacks and subtle defenses will take you beyond the thrill of competition into the realm of creative art. Play Winning Chess is exuberant and conversational, enlivened by personal anecdotes and fascinating historical details.